Games. 13 Played. Won 6. Lost 0. Drew 7. The 1866 rules amended by a meeting of delegates at the Freemasons' Hotel. Umpires were introduced, and were given authority to decide on free kicks and all infringements and interpretations of the rules. Through the fault the spectators continually encroached onto the players; but, considering all things, they behaved pretty fairly." Ends to be changed at half time. All goals to be kicked and not forced through. After goals scored, umpire would throw the ball up in the centre bounce area. At the Melbourne F. C. AGM, one of the games' founders H.C.A. Harrison announced his retirement from playing. Carlton played a practice match at the University Recreation Reserve. Carlton Annual Meeting held at the Bowling Green Hotel, Lygon Street. The room was decorated with Carlton club photos, illuminated addresses, the South Yarra Cup, and a large photo of the First Twenty and office bearers. The eighth annual report stated the 1871 season had been a most successful one. In the two losing games, Carlton had played 15 players as against 20 of the opposition. The club had won the Challenge Cup and were now the premier club of the colony. 1871 Matches, 20 against 20. Vice presidents; John Walls and R. Robertson. Secretary and Treasurer; Thomas P. Power. Committee; H. Guy, F. Goodall, J. Glennon, H. Bannister, A. W. McHarg, B. James, J. Williams, W. Williams. Second Twenty captain; Mr. Thomas Power. The players and the emergencies in the Challenge Cup victory and office bearers were photographed and the picture was presented during the evening. The Cup was to be retained as a club trophy and appointed the club secretary T. P. Power as it's custodian. The committee was empowered to put up a Carlton Challenge Cup. Gold lockets were presented to Clarke, Donovan and T. P. Power for services to the club. An address was presented to veteran members, O'Brien and W. Williams. A vote of thanks was passed to the old captain John Conway who had to retire because of injury. Scratch match on the University recreation reserve. Uniforms and season tickets were distributed to the members. Carlton First Twenty played against a Carlton "next 30" at Royal Park. H. Bannister, Blanchard, Clarke, Donovan, Dismorr, Ellis, Guy, Goodall, Gardiner, Hillsden, W. Johnson, G. Kennedy, MacGibbon, Mooney, Newing, O'Brien, Robertson, Robertson, Wallace, Williams, Williams. The Age on Monday said that due to the weather, none of the matches announced came off. The Argus said Carlton played the Corio Club and The Age said Geelong. The Blues left on the 12.10pm train and were taken to the green near the Villamanta Road where they got ready for the game. The Geelong Advertiser said the Argyle Street ground. The Australasian said they played Geelong; "It is considered to have been as good a match as has been played on the Argyle ground for years, and, being a fine afternoon, attracted many spectators." This match was played as an 18 aside game. J. Arthur of Geelong won the toss and kicked down the ground with the aid of a slight breeze. Carlton's Ellis dislocated his knee and was carried from the ground in the first half. However he had recovered enough to be able to walk that evening, although with acute pain. A rough and tumble affair and many players were penalised from running too far with the ball. Blanchard, Clark, Newing and Bracken all missed easy chances in front of goal, and they put this down to the unusually small ball the home team had provided. The game lasted more than two hours and by 5pm as no goal had been scored, the game was called off. Pompey an aboriginal, played for Geelong. Aram, H. Bannister, J. Blanchard, J. Clark(e), Dismore, John Donovan (Capt. ), Ellis, Guy, Goodall, Gardiner, Kennedy, Macgibbon, Monie, Newing, O'Brien, James Robertson, John Robertson, Todd, Wallace, J. Williams, W. Williams. "In matches between the Melbourne and South Yarra and Carlton and Geelong, for the first time, the game was played with the change introduced in rule 8, which now provides that the ball shall be thrown up by the central umpire directly it is held in a scrimmage. It will therefore be an opportune time to see how it worked, and in what manner it was received. taking the players' opinion on the point, it meets with but few who speak of it with any favour, whilist the spectators, who are also to a certain extent interested parties, declare that it causes the game to lose somewhat of its exciting nature. Before this change was introduced, the game was not stopped directly the ball was held by one player, because a fierce struggle was always going on for possession of the ball. Now, taking Saturday's play for example, the game was entirely stopped; for directly there is even a symptom of a scrimmage, even sometimes with only two players, the central umpire in the zealous discharge of his duties; claims the ball, and then throws it up in the air. Not only does it stop the game, but it exceeds the bounds of an umpire's duty. He should not have the privilege of stopping the game whenever it is his will. It is a dangerous power to trust him with, and could easily be abused, and an umpire should not be supposed to act till appealed to. Several experienced players have entirely agreed with my remarks in last week's issue enent the changes, and think that if the delegates had agreed in the manner therein indicated it would cause a great improvement in the game. That a rule is systematically evaded is no reason why an alteration is required in it. It is well known that a bowler in cricket is not allowed to throw, and yet how often is it openly done? Would not, however, a person be laughed at if he proposed a change in the rules of cricket on that account? And yet that is what has been done in football. If under the old rules the umpire discharged his duty and was properly supported when doing so, all would be well. For an important change like the one under notice not half as much publicity was given to the affair. The Melbourne, by no means an unimportant club in the football world, has not in any way agreed to the change in the rules, and the members have determined to call a meeting to protest, and see what can be done in the matter. The change seems to have been introduced by the South Yarra Club to suit their own special purposes, as it is doubtless thought that with a change the club, almost entirely composed of light-weights, will stand a better show. These changes in the rules can never lead to any good. The old rules were well known, simple, and universally acknowledged. Now a change is made, and for all that is known another change may be required in a few months; leaving matters in a beautiful state of confusion." "... as a fine piece of ground as one could wish to play a game of football on; and it's only drawback is the want of defined boundaries. There is not even a line of trees by which the boundaries could be judged, and a few scattered flag poles at intervals were all the provision made to show where the boundaries of the ground were. Through the fault spectators continually encroached on the players; but, considering all things, they behaved pretty fairly." Donovan won the toss and kicked to the western end aided by a cross breeze. Play lasted from just before 3pm until 5.15pm. Carlton had the better of the play, but Melbourne had the luck and scored a goal. After Melbourne scored, the cry of "Remember the Challenge Cup" went up from the Carlton barrackers. Newing had a late chance to equalise, but missed the goal. Clarke scored a behind with the last kick of the day. Players mentioned; Donovan (Capt. ), Newing, Bracken, Robertson, Guy, O'Brien, Clarke. There was some confusion as to where this match was to be played. The match was played as a 16 aside game. 30 minutes before time, Donovan with a smart kick from a group of players put the ball through. He then scored the second goal from "a splendid place kick - as fine and true a kick as could be desired." Aram, Blanchard, Bannister, Bracken, Dismorr, Ellis, Guy, Goodall, Gardiner, George Kennedy (Capt. ), MacGibbon, Newing, O'Brien, Robertson, Robertson, Todd, Wallace, G. Whitehead, Williams, Williams. Carlton Reserves/Second Twenty played East Melbourne in Royal Park. Amess, Bailey, Barrass, Brisbane, Dobson, Gillman, Hedrick, Henderson, Healy, E. Jones, W. Johnston, T. Kennedy, McHarg, Muir, J. Newing, Page,Prevot, Thomas Power (Capt. ), Robertson, Robertson, Sharpe, Thomas W. Templeton, Wright. Bannister, Bracken, Carter, Donovan, Dismorr, Ellis, Guy, Goodall, Gardiner, G. Kennedy, Macgibbon, Monie, W. Newing, O'Brien, James Robertson, Todd, Wallace, G. Whitehead, J. Williams, W. Williams. Emergencies; Hillsden, Adam Kennedy, Hassett. Goals; W. Newing, G. Kennedy. Carlton Second Twenty/Reserves played Albert Park Reserves at Albert Park. The team met at the Melbourne Town Hall, Swanston Street at 2pm. Carlton 16 played Collingwood 20 at North Fitzroy. No team details or result. Carlton Reserves/Second Twenty played the Southern Club at Fawkner Park. The Blues kicked to the Richmond end. "For the first hour Carlton played two men short, but defended their goal pluckily and well, though their exertious evidently told upon them at the finish of the game, the ball for the last twenty minutes being kept in close proximity to the Carlton goal. After one of the roughest and best contested games ever played in the colony, a draw was the result. Such was the enthusiasm of the players that both sides refused to listen to the rulings of the umpires to stop play, continuing the game till darkness put an end to the contest." Donovan (Capt), Bannister, Bracken, Blanchard, Clark, Dismorr, Ellis, Guy, Goodall, Gardiner, Hillsden, G. Kennedy, Macgibbon, Monie, Newing, O'Brien, James Robertson, Wallace, J. Williams, W. Williams, G. Whitehead, Todd, Johnson, A. Kennedy. Carlton played the annual President vs Vice President match in Royal Park at 2pm. Carlton 16 played Richmond 20 at Royal Park. An easy victory for the Blues against the Richmond 20. John Donovan (Capt), Bannister, Bracken, Blanschard, Dismoor, Guy, Gardiner, Johnstone, G. Kennedy, Macgibbon, Monie, Newing, O'Brien, Todd, Wallace and Williams. Goals; Donovan 2, Newing, Guy. Carlton Reserves played South Yarra at South Yarra. The players met at the town hall at 2pm. Aram, Bannister, Blanchard, Bracken, Dismore, John Donovan (Capt. ), Gardiner, Guy, Kennedy, Kennedy, Monie, Macgibbon, Newing, O'Brien, Todd, G. Whitehead, Wallace, J. Williams, W. Williams. Carlton Second Twenty played North Melbourne in Royal Park. "The football season is in full swing, and the game has firmly established itself as the recognised winter pastime. In Melbourne and it's suburbs there are about thirty clubs, while each country town of any note throughout the colony has one or more. The popularity of the sport is attested by the fact that a match between two good clubs will draw two or three thousand people. Up to the present time the Melbourne club has not suffered a defeat, while at the same time she has conquered all comers, including their old rival, the Carltonians, with whom the two matches played resulted, one in her favor and one in a draw." Originally Carlton was fixtured to play the Metropolitan Police Force in Richmond Paddock. Carlton played a scratch match in Royal Park. The Argus reporting on a Melbourne-Collingwood game said that five or six Carlton or East Melbourne players played for Collingwood*. One of these ring-ins was the Carlton captain. "He should have known better than to have played in this match, as he ought well to be aware that the Melbourne were not expected to give odds to a team in which there were any Carlton men, more especially when there is one who is supposed to be about the best in his club. It would not be very gratifying to the Carlton if several of the Melbourne men, or some from other senior clubs, were to play with a junior club in the next match Carlton play against them. In fact it would, perhaps, be a proper rule to insist on a person playing for one club only, as it would save a good deal of unpleasant feeling." "South Yarra were the first offenders in this respect, as when going up to Sandhurst (Bendigo) they played with two Melbourne men." Carlton were to play Albert Park at Albert Park. This match did not go ahead due to the weather. Blanchard, Bracken, Donovan, Dismore, Ellis, Goodall, Gardiner, Guy, Kennedy, Kennedy, Johnston, Monie, Macgibbon, Newing, O'Brien, Todd, G. Whitehead, Wallace, Williams, Williams. "The Carlton and Albert Park had arranged for a match to be played at Albert Park, but the majority of their players thought it too much of a joke to be expected to play in such weather, and as only four or five on either side turned up, the match lapsed." Carlton Second Twenty/Reserves played Albert Park in Royal Park. The morning was fine, but it rained from 11pm till 2pm. The Blues home ground was too wet and slippery and considerable time was wasted looking for a suitable piece of dry ground in Royal Park to play on. Play got under way at 3.45 pm with Carlton's 16 playing against a Melbourne 15 who were waiting for one of their players to turn up. The match was due to finish at 5pm sharp so the play was fast and furious. Newing was busy "Where he was playing the ground sloped much and the ball rolled considerably when kicked. He just secured it before it went out of bounds, and sent it right into Donovan's hands who was about 15 yards from goal." "I have seen a great many games of football, but do not think I ever witnessed such a scene of excitement as ensued when this goal was scored. The Carlton players were near frantic with joy at having wiped off their defeat on the same ground in the early part of the season." Players mentioned; Donovan, Guy, Gardiner, Dismorr, Newing, Goodall. Carlton played South Yarra at South Yarra at 2.30pm. South Yarra's mismanagement problems are resurfacing. This match did not go ahead because South Yarra failed to have sufficient players, only 8 or 9 of their players turned up. "The Carlton men were very much disgusted at the state of things, and anything but blessings were poured out onto the heads of the devoted South Yarraites." Carlton Reserves played South Yarra at Royal Park. Carlton 16 played Richmond 20 at Richmond Paddock. The ground was in poor condition and the trees proved to be an obstacle. The game was very even and Richmond had a few chances of scoring. Blanchard, Bracken, Dismorr, J. Donovan (Capt. ), Gardiner, Goodall, Guy, Johnstone, G. Kennedy, Macgibbon, Monie, O'Brien, Wallace, Williams, Adam Kennedy, Whitehead. Carlton Reserves 17 played Carlton Imperial 20 at Royal Park. "At last footballers have been favoured with a fine day, a day on which they could persue their much loved sport without having to undergo any of the pains and penalities attendant on playing on a wet, muddy ground. A bright sky above them, with a sun rather unseasonably warm, but tempered by a nice mild wind, left nothing wanting to enhance the afternoon's enjoyment. Spectators there were in plenty, more than have been seen for the last six or seven weeks. The ladies decked out in all their bravery, the gorgeous colours of their dresses contrasting with the various uniforms of the players, formed a bright, ever-changing scene that was pleasant to look upon, independently of the one common attraction that had brought them all together. The Richmond paddock was at its best on Saturday. It looked, from one end to the other, like an immense fair, covered as far as the eye could reach with players, and each body of players surrounded by its separate knot of spectators. 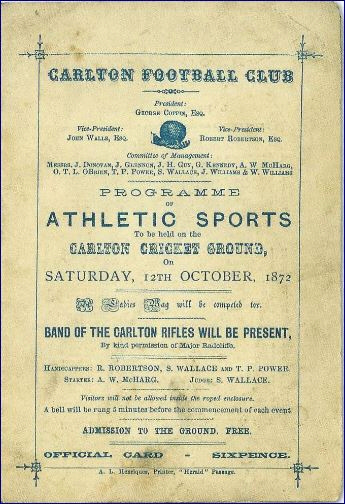 There were matches of all sorts going on, from those got up on the spot between a few children to matches between rival schools , then others between clubs of a little more renown in the football world, and lastly those in which the greatest interest of the day centred - the games between the senior and junior clubs, the Carlton against the Richmond and the Melbourne against the East Melbourne, each of the former playing at the odds of 16 to 20. As with the Richmond-paddock so with the Royal-park, Fawkner-park, and all the reserves around Melbourne in which footballers are accustomed to disport themselves; but the principal attraction of last Saturday was in the Richmond-paddock. The spectators, at first orderly, kept well within the boundaries, but as the play gets exciting, they gradually encroach, first one side, then another, till by degrees the playing grounds get narrowed, and when the ball is kicked towards the wings, the players are amongst the crowd, and sauve qui peut is the cry as they are driven back, only to come forward again directly the danger is over. It is very annoying to the players that his should be so, but the subject has been so much commented and written on without having had effect that it is useless to do more than mention that the onlookers were, as usual, most troublesome, in fact a greater nuisance than ever. Several times were some of them thrown, and in one or two instances the players themselves got nasty falls by a spectator running across them. Not content with encroaching themselves, they even encouraged their dogs to do so. One of the severest falls of the day was received by a Melbourne man, who tumbled over a dog without seeing it; it almost stunned him." A beautiful day and the ground was in good condition. John Donovan (Capt), Bracken, Blanchard, Dismorr, Guy, Goodall, Gardiner, G. Kennedy, Adam Kennedy, Johnson, Monie, Macgibbon, Newing, O'Brien, James Robertson, Todd, Wallace, J. Williams, W. Williams, Whitehead. Carlton Reserves played Albert Park in Albert Park. The Carlton team met at the Town Hall Swanston Street at 2pm. Tom Power (Capt), Aram, Bailey, Brisbane, Carr, Goddard, Henderson, Hedrick, Healy, Jones, T. Kennedy, McFarlane, McHarg, McKenzie, McClure, J. Newing, C. Robison, G. Robertson, Sharpe, Templeton, Wright. Carlton 16 played Collingwood 20 at Royal Park. The Blues were ready and waiting, but only 8 Collingwood players turned up. There seems to have been some confusion as to where the match was to take place, The Age mentions North Fitzroy. "It is very galling to be treated in this way, and if the members of a club like the Collingwood cannot manage to turn up when chosen, other clubs will not be so willing to arrange matches with them. There is no excuse for them in regards the weather, as it was a beautiful afternoon for playing. A dissapointment of this sorts spoils an afternoon which might have been profitably devoted to another match. The Carlton men did not waste the afternoon, but amused themselves with some good practice." L. Bracken, John Donovan (Capt. ), J. Dismorr, H. Guy, Goodall, Gardiner, Adam Kennedy, W. Johnson, Monie, MacGibbon, W. Newing, O'Brien, James Robertson, Todd, Wallace, J. Williams, Whitehead. This match was a walkover for the Blues as the Collingwood team failed to show. Carlton Reserves played East Melbourne at Richmond paddock. Tom Power (Capt), Aram, Bennett, Bailey, Brisbane, Carr, Goddard, Henderson, Hedrick, Healey, Jones, Kennedy, McFarlane, McKenzie, Muir, J. Newing, C. Robison, G. Robertson, Sharpe, Templeton, Wright. Carlton lost; 0 - 2. "In these two teams were to be found the best of the youth and strength of the city - all picked men, not a weed among the 40. Equal in reputation, great was the rivalry between them." An immense crowd saw the game commence at 3.15pm. A detachment of police kept the crowd off the ground. Early on Carlton were the better side, but Melbourne got on top and scored what would be the winning goal at 4.20pm. The Melbourne goal scorer, Towle, later kicked the longest drop kick seen in the colony measuring some 71 paces. J. Donovan (Capt), Blanchard, Bracken, Clark, Dismorr, Guy, Gardiner, Goodall, R. Henderson, Johnson , G. Kennedy, Adam Kennedy, MacGibbon, Monie, Newing, O'Brien, James Robertson, Wallace, J. Williams, W. Williams. Emergencies; G. Whitehead, Todd, G. Aram. This was the fourth and last game of the season between these two clubs. Carlton had won 1 game, drawn 1 and lost 2. Players mentioned; Donovan, G. Kennedy, Gardiner, Dismorr, Blanchard, O'Brien, Monie, Macgibbon, Adam Kennedy, Goodall. Carlton played Ballarat at Royal Park. The game was played with 14 a side. A good attendance watched a one side game, with the crowd encroaching onto the playing area. The Ballarat men were no match for the Blues, with many of their better players missing. Rix was named in the Ballarat tem, Henry F. Rix? Carlton 16 to play Collingwood 20 at Royal Park. Due to bad weather most football matches were cancelled. George Kennedy (Capt), Bracken, Blanschard, Dismorr, Guy, Gardiner, Goodall, Johnson, A. Kennedy, Macgibbon, Monie, O'Brien, Jas. Robertson, Todd, Williams, Whitehead. F. Goodall (3 yards), Monie (4 yards), R. C. Henderson (7 yards), W. Marshall (8 yards), W. L. McFarlane (9 yards), W. Newing (10 yards), J. Ellis (10 yards), J. Newing (10 yards), W. Guy (11 yards), J. Lennon (12 yards), H. Jones (15 yards). J. Macgibbon, G. Kennedy, W. Newing, G. Whitehead, J. H. Guy, J. Gardiner, J. S. Dismorr, Monie, W. Johnson, F. H. Goodall, U. Todd, James Ellis. J. S. Dismore - 59 yards 9 inches, W. Johnson - 47 yards 6 inches. T. Aram, G. Robertson, W. H. McClure, S. Bennett, J. Healy, J. Newing, J. Glennon, Thos. P. Power, T. Kennedy, R. C. Henderson, V. Robertson, C. McFarland, J. Kemp. R. Richardson, A. J. Azzopardi, B. James, W. Browning, sen.
G. Robertson (silver goblet) 47 yards 3 inches. "In the evening a dinner of the members of the club took place at the Carlton Club Hotel, at which the prizes were presented to the winners. The captain of the club, Mr. John Donovan, was in the chair, and Mr. George Kennedy, vice captain, in the vice-chair." 1872. Premiers. Melbourne, 2. Carlton, 3. Albert Park. The Carton Story. Hugh Buggy and Harry Bell. Pages 27,28,259. Mullen's Footballer Australian Almanac of 1951. Page 66. Page last modified on Saturday 28 of July, 2018 00:17:32 AEST by blueycarlton. 1993 Rd 8 - Carlton Match Committee.